Boa constrictors are nonpoisonous snakes endemic to Central and South America. They are very large, with males measuring 6 to 8 feet and females measuring 8 to 10 feet. In the wild, their diet consists of amphibians, birds, lizards, small mammals and other snakes. Regardless of size, all boas will consume the same type of prey, as long as they can swallow and digest it. A diet for boas in captivity is quite another matter. Never feed your pet boa live food. Encouraging your boa to hunt will make it more aggressive, and neither is it a humane end for the prey. The prey might also escape or injure your boa. Do not attempt to catch small mammals for your boa, either. Wild animals can have parasites or bacteria that will make your pet boa sick. Even in captivity, boas need to consume their entire prey – fur, feathers, bones, everything. Therefore, never feed your pet boa meat meant for human consumption, whether it's cooked or raw. Depending on how large your pet boa is, it can consume small chickens, rats or rabbits raised, killed and frozen specifically for the purpose of feeding wildlife in captivity. Younger boas should eat baby or small, young rats, while larger, full-grown boas can consume large rats. To figure out whether your pet boa can consume its prey without choking, make sure the prey is no larger than the widest point of the boa's midsection. Keep a bowl of fresh water in your pet boa's cage at all times. Do an Internet search of companies that raise mice, rats, chickens and rabbits for the purposes of feeding pet boa constrictors and other carnivores in captivity. These small mammals are raised in sterile environments and fed diets that guarantee your pet won't get contaminated with parasites or bacteria. They are then killed and frozen before being sold. Make sure your pet boa's food is thawed out and slightly warm. It is recommended that you feed your boa in a different container from its habitat. Doing so will keep your boa from accidentally consuming substrate and from associating its cage and your hand with getting fed. Always use forceps to place the food in your pet boa's container. You can also use a handling stick to keep your boa away while you place the food inside for it. Never try to feed your boa by hand or it might bite you. 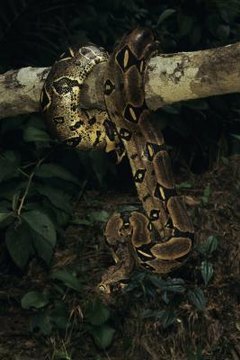 Boas, like other snakes, hunt using their sense of smell. Therefore, wash your hands well after you handle the snake's food. Do not handle your pet boa for at least a day after you feed it or it may regurgitate. Feed nocturnal species of boa at night.